People from all over south central Texas come to work on the farm. None of them get paid, but they all get something in return for the hard work they put into Brad and Jenny Stufflebeam’s Brenham farm. Carol Montgomery stands near the Stufflebeam’s horse-drawn wagon which has been pulled up to the loading dock at the Stufflebeam’s Home Sweet Farm, as she wipes her brow she admits she has completely different motives. “A lot of times you have to lead by example,” Mr. Stufflebeam said. “Farmers and ranchers are a skeptical lot to begin with, but people need to see there are different ways." Volunteers are a large part of Home Sweet Farm, they get a full share of veg­etables in return for their work, but it means so much more to the Stufflebeams than a free source of labor. Even before starting Home Sweet Farm 7 years ago Mr. Stufflebeam was in­volved in agriculture, working as a horticulturist for 20 years. Before coming to Washington County the Stufflebeams owned and operated the first 100 percent organic nursery in Collin County. He also served as operations director for World Hunger Relief, located in Elm Mott, with much of the work done through intern­ships and volunteer programs. After a while of doing this Mr. Stufflebeam decided he wanted to make a living on the farm and at the same time fulfill a need out there for fresh, nutrient-dense vegetables which are usually not found in grocery stores. Through all of that work people have come to the Stufflebeam family to get food and to learn. There are two young men who are regulars at Home Sweet Farm, Caleb Preston of Waller and William Amelang of Burton. “We’re here learning how to farm,” grunted Caleb as he loaded vegetable-laden boxes into an awaiting delivery van. The lessons Caleb and William learn at the farm, everything from irrigation techniques, to storage, delivery and marketing will help make future endeavors more successful. 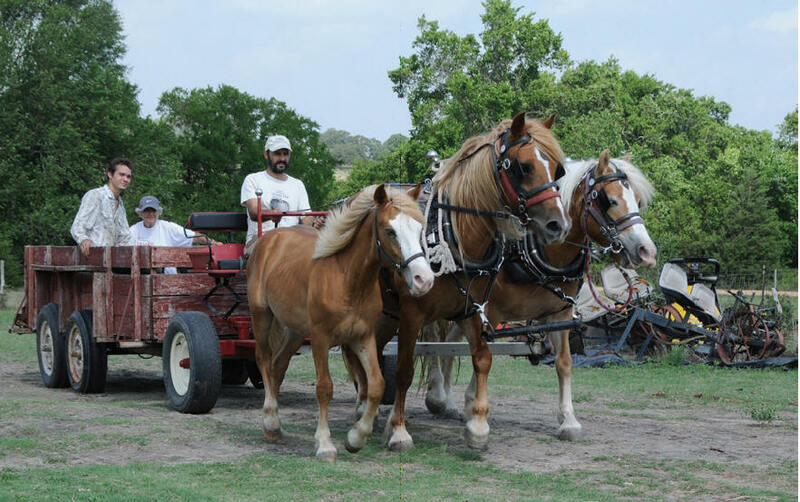 As a past president of the Texas Organic Farmers and Gardeners Association Mr. Stufflebeam worked to get young people more involved in farming and provide them with enough practical information to get started with a farm of their own. Many were skeptical when Mr. Stufflebeam and his family moved to their Washington County farm, but as the years have passed people have learned there are other things to do with land than grow hay and raise cattle. “A lot of times you have to lead by example,” Mr. Stufflebeam said. “Farmers and ranchers are a skeptical lot to begin with, but people need to see there are different ways. It’s been a long row to hoe to make that living. Seven years ago the Stufflebeam’s had 26 shareholders in their CSA operation. Now, they have 250 – most from the Houston area. A van loaded with fresh vegetables heads out twice a week to 12 different drop locations around the Houston suburbs. Shareholders get a wide variety of vegetables, everything from potatoes, squash, zucchini, tomatoes, greens, cabbage, beets, okra and many other items as they come into season. Plus, for those who volunteer their time, spending a few hours a day on the farm can melt away the worries from the outside world. “Most of the time I work as a mediation attorney,” 81-year-old Harold Graham said. 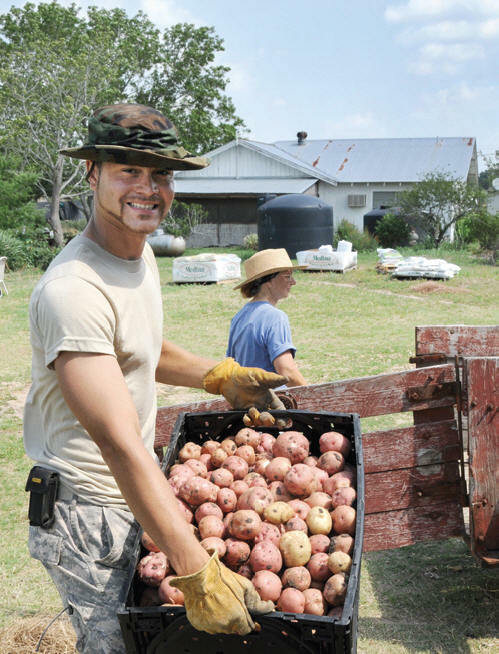 “Yesterday I was working a divorce media­tion between a couple, and today I’m out here working on the farm – it’s a pleasant diversion,” he added, even after digging potatoes on a 90-degree day.